Return to Forever, one the best jazz fusion bands ever, were spectacular back in 2008, when they performed at the Regency on Van Ness. That exciting tour celebrated a 30 year reunion of the most popular incarnation, featuring co-founders Chick Corea on keyboards, and Stanley Clarke on bass, with drummer Lenny White and guitarist Al DiMeola. An amazing show and subsequent albums, DVDs and live recordings would soon follow. This time RTF re-emerges sans DiMeola, and his stead is guitarist Frank Gambale and an unexpected bonus: France's incomparable jazz violinist, Jean-Luc Ponty. Ponty is no stranger to either RTF, or young Dweezil Zappa, having performed on some of the late Frank Zappa's greatest albums. The Warfield performance opened with Dweezil Zappa, who had an amazing command of his father's repertoire. Zappa had killer musicians in those days, like the aforementioned Ponty, George Duke, Chester Thompson, Ruth Underwood (she was amazing on marimba & xylophone), Napoleon Murphy Brock, Terry Bozzio, Patrick O'Hearn, Eddie Jobson, just to name a few. That group and the others that followed would go on to play Zappa's most challenging compositions. I'll confess, I'd gotten my first Zappa album, "Freak Out", when I was 12, so I'm no stranger to Zappa's music. That being said, Dweezil and his group performed them with the same mind-bending musicianship, as well as the humor that was part of the Zappa genius. The crowd loved them, and they closed the set with "Hot Rats", featuring Dweezil and joined by Gambale on guitar. Return to Forever IV started off in Canada before heading to Europe and Zappa Plays Zappa joined them for the beginning of this latest leg. 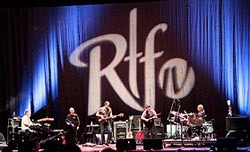 Like Zappa, I'd first seen RTF in the days before DiMeola with guitarist Bill Connors. The addition of Ponty and Gambale has added a unique, new flavor to the group. A leader in his own right, Ponty, still possesses that grace and his gorgeous touch on violin rarely heard in jazz. My favorite part of the show perhaps, was RTF IV's version of Ponty's "Renaissance"; beautifully re-imagined by Corea, Gambale and Clarke, with Ponty easing out of the shadows with his awe inspiring melodies, accented by White's rhythmic prestidigitations. Watching the quintet, I couldn't help thinking about the other late 70's jazz rock "offsprings" of Miles Davis; Weather Report, and John McLaughlin's Mahavishnu Orchestra. Of them all, only Return to Forever still remains. Although the members of the Mahavishnu Orchestra still survive, it is unlikely that their line up of guitar, violin, keyboards, bass and drums will every reunite beyond a studio track or two. Last week, I saw the 68 year old Diana Ross still belt it out with the best of them. At 70, Chick Corea is still every bit as amazing. Perhaps it is only fitting that Ponty, who also once performed with the Mahavishnu Orchestra, and Gambale joined RTF for this outing, re-imagining their music. Corea, Clarke and White looked particularly happy, clearly enjoying and appreciating the music and the audience. White let the crowd know that he was particularly grateful to be back in San Francisco, (many of his albums were recorded at Different Fur Studios), and recognized them "People who know good music, music that isn't played on radio & MTV, or wherever they play it these days!"